The City of Urbana welcomed Races by Bobby Joe Scribner (Woodstock, IL) to the corner of Race and Green Streets in Urbana. 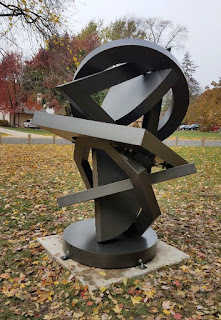 According to the artist, the sculpture represents abstract figures connected to one another as they strive forward. The sculpture is the final installation of the year from the Public Art League's 2018 call to artists. It was generously sponsored by the City of Urbana through its public arts program. You are invited to our annual Installation Celebration. 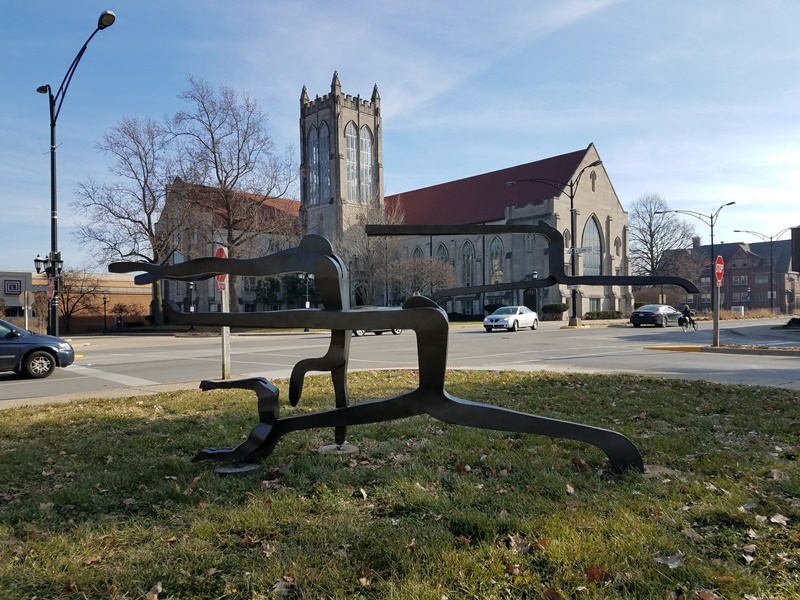 On the evening of December 4, 2018, we will be celebrating the installation of several new sculptures in the Champaign-Urbana area over the past year. Please join us for a night of drink, food and friends of the Public Art League! Six New Sculptures Welcomed This Fall! 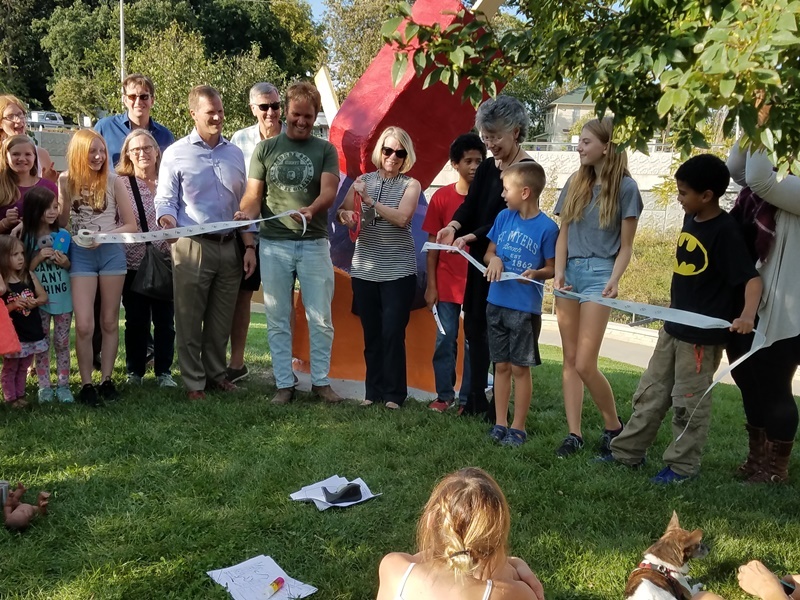 The Champaign, Urbana and Monticello-area welcomed six new sculptures this fall (with more to come before the end of the year). The sculptures were brought to the community through the Public Art League program and made possible through the generous support of the program's sponsors. Ice Pops, by artist Craig Gray (Key West, Florida), was installed in the green space at Griggs and Race Streets (near the Boneyard Creek) in Urbana. Gray states that the piece was inspired by "Roadside Americana." "Icons of the national landscape today are pushed away and replaced by branding from national chains." 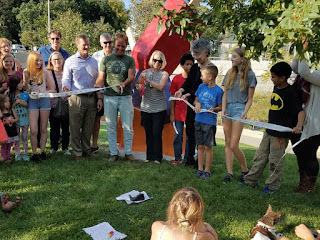 The Urbana Public Arts Program (through the City of Urbana) coordinated a ribbon cutting ceremony with comments from Urbana Mayor, Diane Marlin. 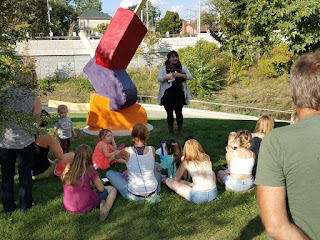 Many young art enthusiasts attended and were able to ask questions of the artist and Urbana Public Arts Coordinator, Rachel Storm. The installation of Ice Pops was made possible by a donation from long-time PAL supporter, MCDJ, LLC. 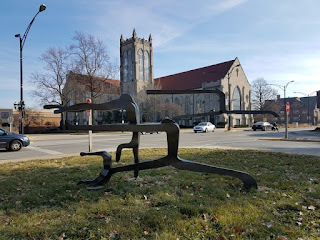 Downtown Champaign welcomed two sculptures: Tip-See by Craig Snyder (Plymouth, MN) and Stepping Out by Don Lawler (Stephensport, KY). Tip-See is installed on the northeast corner of Market Street and University Ave. in front of Pour Bros. Taproom (who generously sponsored the installation of the piece). 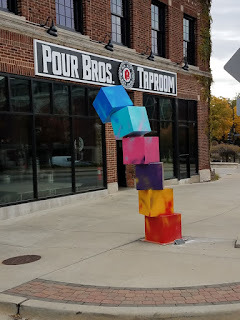 Artist Craig Snyder states: "As any kid will attest, it's monumentally fun to stack blocks as high as possible before they fall. It's also completely irresistible to not knock them over." One Main Plaza welcomed Stepping Out in the landscaped island near Big Grove Tavern. The sculpture was carved from Indiana limestone by artist, Don Lawler. Of the piece, the artists describes it as "a female figure taking that tentative step into the unknown. 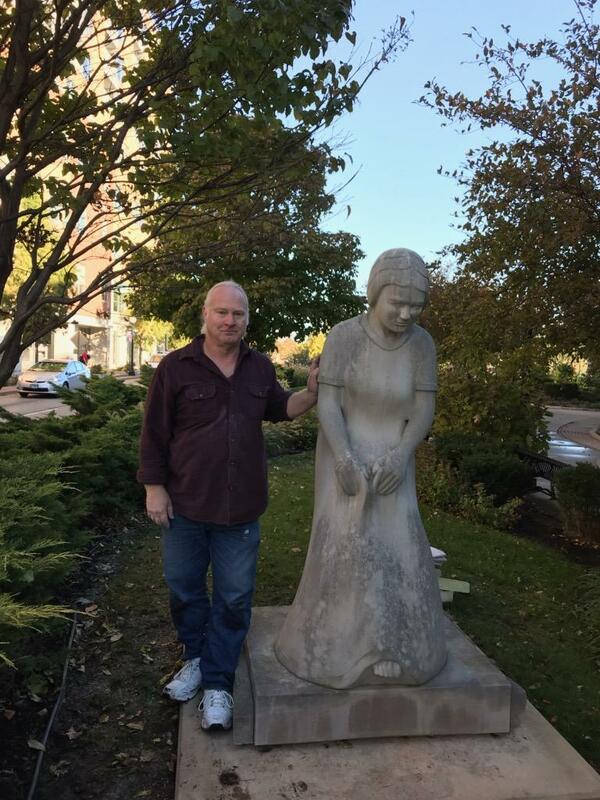 The concept behind the sculpture is that we must put aside our fears and 'get our feet wet.'" The installation of Stepping Out was made possible through donations by the "Friends of PAL." In addition to Stepping Out, a second piece by Don Lawler was also installed this fall. 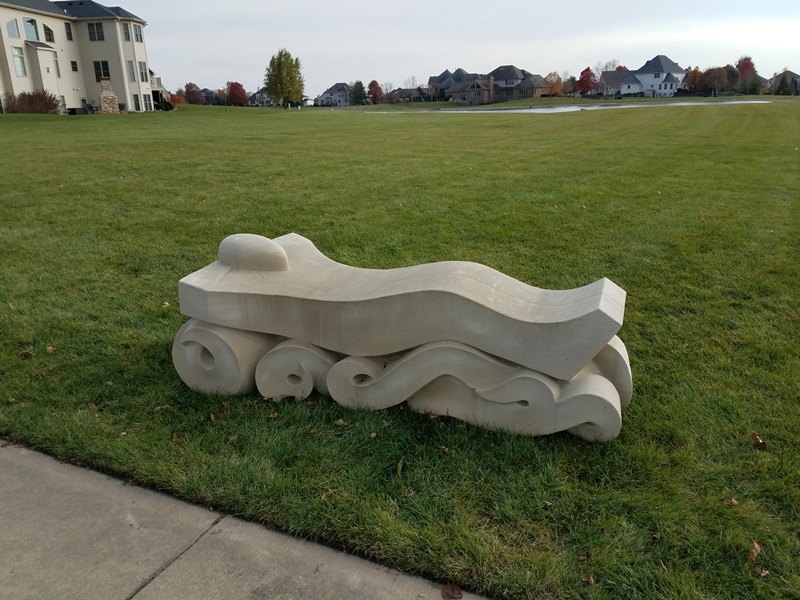 Daydreamer Bench was installed in a large commons area along a trail in the Trails of Brittany subdivision in southwest Champaign. Daydreamer Bench is described by Lawler as a functional sculpture showing a person floating away on the winds of thought." The installation of the sculpture was generously sponsored by MCDJ, LLC. 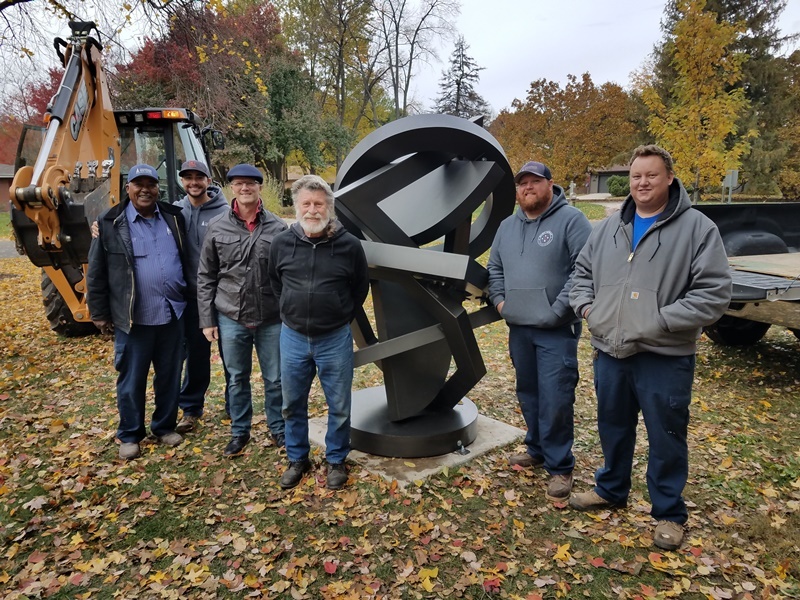 It has been a great honor for the Public Art League to work with Robert Allerton Park in Monticello to install new sculptures on the historic grounds. This fall, Chicago Peace Tree, by Nicole Beck, was installed. The sculpture celebrates the endangered ash tree by representing an ash leaf and ash tree canopy. The sculpture can also be illuminated for viewing after dark. A big thanks to the "Friends of Allerton" for making this installation possible. 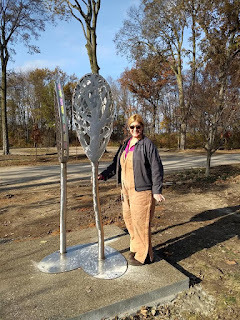 The Public Art League has also enjoyed a great partnership with the Champaign Park District. 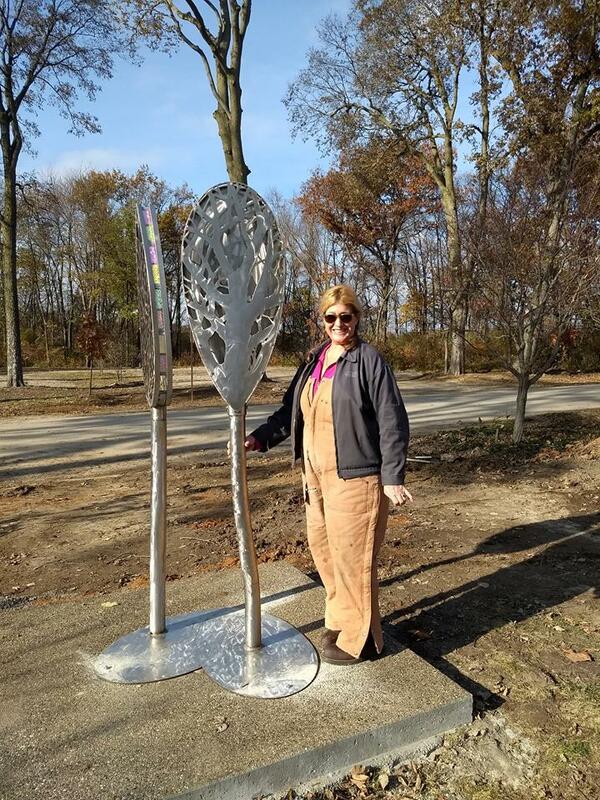 This fall, Kwami (by Ray Katz of Pontiac, MI) was installed in the northwest corner of Hessel Park. As is traditional of Katz's work, there are many interlocking elements within the piece. The installation was made possible through a donation by the Park District with the always-stellar support of the Park District's installation crew. 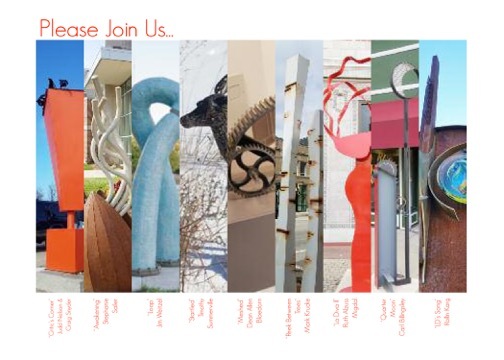 The Public Art League looks forward to one more installation (Races by Bobby Joe Scribner) before the end of the year!